Birmingham, Alabama—December 6, 2012—Two groundbreaking photographic exhibitions shot by fashion photographer David Jay are set to premiere at University of Alabama at Birmingham’s Visual Arts Gallery: The SCAR Project: Breast Cancer Is Not A Pink Ribbon and The Alabama Project: The Civil Rights of Health Care. The dual exhibition opens January 7 and runs through January 31, 2013. There will be a ticketed opening night gala on January 11, 5-9pm. General admission to the exhibitions, is free. Private gallery tours with photographer David Jay will be available. Regular screenings of Baring It All, the EMMY Award winning documentary about The SCAR Project will be shown throughout the exhibition. 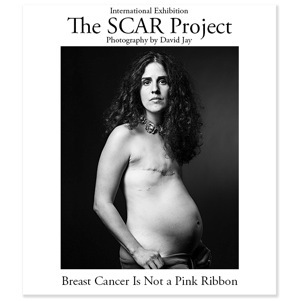 The SCAR Project is a series of large-scale portraits of young women confronting breast cancer shot by fashion photographer David Jay. The SCAR Project puts a raw, unflinching face on young women and breast cancer while paying tribute to the courage and spirit of the many brave, young women fighting this disease. The SCAR Project subjects range in age from 18-35 and represent the often overlooked, group of young women living with breast cancer in our country today. They’ve journeyed from across America and the world to be photographed for The SCAR Project. More than 100 women have been photographed thus far. The Alabama Project: The Civil Rights of Health Care is a subset of The SCAR Project. In this project Jay documents a group of young women in Alabama, all in their twenties, battling not only breast cancer but the healthcare system itself. From hospital room to the living room, Jay’s poignant images capture each woman’s faith, perseverance, and beauty. Producers: Cynthia Ryan, Ph.D., Associate Professor of English, UAB Birmingham & John Thomas Fields, Interim Director, UAB Visual Arts Gallery. For more information on The SCAR Project visit the website: www.thescarproject.org and www.thescarprojectblog.com. Follow thescarproject on Twitter and Facebook. 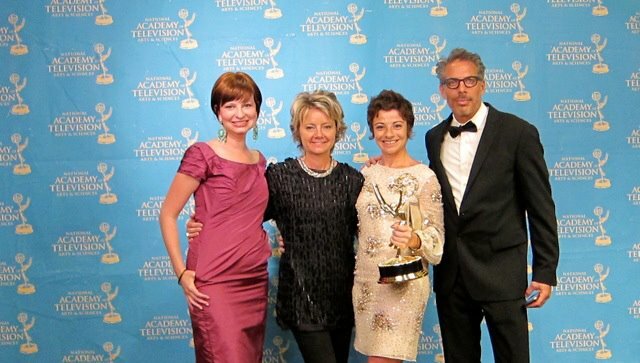 “Baring It All”, The SCAR Project Documentary by Patty Zagarella Wins an Emmy Award! Tune in to (or TIVO) the Emmy’s this Saturday to see Patricia Zagarella’s Baring It All take home and Emmy for her groundbreaking documentary about The SCAR Project! Bravo to Style Network’s Taylor Hennessy, “Baring It All” Co-producers Nicola Bates and Patty Zagarella (also director and filmmaker), and SCAR Project Photographer David Jay for the win! “Baring It All” follows fashion photographer David Jay, into the worlds of four young breast cancer survivors, exploring their journeys and being photographed for the SCAR Project. “Baring It All” portrays what: [Surviving Cancer. Absolute Reality.] Is really all about, for them (and for the more than 10,000 young women like them, who are diagnosed each year). “Baring It All” uncovers what’s beneath the pink ribbons. To view trailers for Baring It All click here and here. Q: First of all, congrats and namaste on the Emmy, Patty! How cool is it to win an Emmy for a passion project like The SCAR Project?! A: This is the most incredible honor BUT the award really belongs to all the courageous young women who participated and to David Jay. Q: How did you find out about The SCAR Project? A: David Jay and I have a mutual friend, who was visiting NY from Australia. She randomly bumped into David while on her visit and he told her about the Scar Project. She then sent me a link and my co-producer, Nicola and I, were blown away by the photographs – the beauty and the pain, every image and every woman’s eyes screamed a different story we wanted to learn more. Q: What inspired you to start filming the documentary? A: When I first saw the SCAR Project I was captivated by the raw reality conveyed by his photos. Striking and beautiful, yet confronting and almost brutal, they pushed me to a place I normally contentedly avoided. I was both shocked and saddened, but drawn to the images like a magnet. Despite that the photos spoke volumes, I had a barrage of questions screaming in my head, not only about the young women in the photographs but also about the photographer: Who was he? Why was a successful fashion and beauty photographer photographing young breast cancer survivors? Why did he embark on this journey and what motivates him to continue? Fascinated, I reached out to David Jay – who reached back with enthusiasm and warmth. I then met a genuinely kind and caring man, whose world had been turned upside down when confronted by a close friend’s body after a mastectomy. He told me that he dealt with it the only way he knew how, by taking her picture. And the rest is history. A: We were an all female team during the photo shoot sessions, our goal was to be unobtrusive and document the event, what we experienced was a palpable transformation taking place before us. Women would come to the door broken and nervous and by the time they left, they had a renewed sense of pride, hope and strength. Every single woman exuded beauty that came from her resolve and attitude, which David captured perfectly. It was a very special experience, albeit a tough one, being able to capture this transformation, to be able to share in the anguish, the pain, the tears and the laughter. Q: What were some of the hi-los of filming this project? What surprised you most about filming “Baring It All”? A: Meeting and spending time with these amazing, strong young women has been an incredible high. I have been touched in a profound way by all the women we met, and I’ve learned so much from them – celebrate life and live in the moment. I remind myself of that daily. The lows have obviously come when confronted with beautiful young girls struggling to beat this horrible disease. What surprised me most was the enlightened attitude of such young women and their strength in the face of their mortality. Q: How did you get into filming? A: I started working in TV & film in Australia after graduating from University. My first job was working at a TV station and it just went from there. Q: What do you consider your particular calling in the film industry to be? A: I enjoy producing, finding compelling stories and character, and then finding the right team to execute that story. I really love meeting people and learning about them, and under the pretense of filmmaking I get to ask lots of questions most people are afraid to. Q: What other film work have you done? A: I started working in narrative features, but then about 7 years ago I was presented with the opportunity to co-produce a documentary, and from that point on I was hooked. I loved telling real stories by real people. Who needs a script, real life is far more compelling, heart-warming, and heartbreaking. A: The doc was originally titled “Don’t Look Away”, a title Nicola my co-producer came up with. We decided on that title early on because people’s initial reaction at hearing about the subject and photos was to look away. The entire message and point of the project was to remove the stigma and normalize something that so many women undergo but no one ever sees or talks about. We wanted people to look at the photos, look at the women, at the scars, and at their eyes. The name was changed when the Style Network came on board as they felt that “Don’t Look Away” didn’t adequately describe what the film was about. After much back and forth, we settled on “Baring It All” as the new title. Q: How did the Style Network come on board with the documentary? A: Two great women, Beth and Andrea from Remarkable Content took my trailer to the Style Network about a year before they actually came on board. The VPs at Style thought it was an important story to tell and one that their viewers could connect with, however one-off documentaries were completely out of the realm of their usual programming that it just didn’t work. They came back to me about a year after our initial conversation and the VPs had come up with an over-brand series called Style Exposed, which would include one-off documentaries. “Baring It All” is the first in the Style Exposed series. Hopefully tonight’s success for Style compels and propels them to continue to produce one-off documentaries with heart. Q: Is the documentary available on DVD? A: The DVDs are available through Amazon. The SCAR Project, Volume 1 book is also available on Amazon. Q: How would you articulate the message you hope people get when they view your doc and the SCAR Project? A: I want people to see that there is true beauty in strength and hope in the face of despair. There’s power in optimism and it’s ok to have scars and to look at them and let people see them. In line with the SCAR Project message, the goal is to raise awareness and let people know that young women can and do get breast cancer. Early detection is the best prevention, therefore the more people who see the film or the SCAR Project photos the bigger the impact. Q: How can people follow you, support the amazing things you are doing like this documentary? A: People can keep up to date with my work via my website atwww.lostinvision.com or via Facebook. A: I’m developing a project that deals with alternatives to incarceration, with a focus on young women who are at risk, and we hope to help transform their lives before it’s too late. Q: I have to ask… did you sleep with the Emmy? I mean… who wouldn’t? A: LOL those wings are spiky! It was a night to remember! I’m on cloud 9 and SO PROUD of everyone involved with The SCAR Project & Baring It All, especially the amazing, powerful and beautiful young women living the reality of breast cancer, thank you for sharing your stories. Q: Not really a question, but I’d just like to thank Patricia for a brilliant interview and also say “go break a leg!” in re: the “Baring It All” award at the Emmys this Saturday night. And I’ll just go ahead and say BRAVO! because I know it’s going to, as The SCAR Project intends: Raise public consciousness of early-onset breast cancer, raise funds for breast cancer research/outreach programs and help young survivors see their scars, faces, figures and experiences through a new, honest and ultimately empowering lens. So kudos Patricia. Cheers and kudos. I’d also like to give a little shout out to Cincy SCAR girl Vanessa Tiemeier’s sister, Christina Blust, whose music plays the soundtrack to her sister’s SCAR story in Baring It All. Click here for more of Christina’s music.